This Elstead Shannon 1 light rust proof hanging outdoor porch lantern in black with polycarbonate shade and rated IP44 features simple classic style. 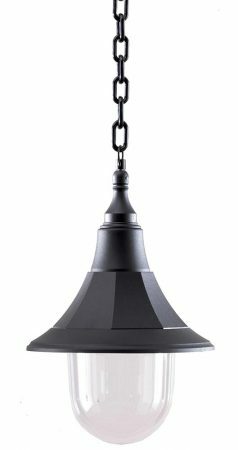 Ceiling mount, chain suspension and small hanging lantern, with sloping brimmed roof and pill shade containing the lamp bulb. Part of the coastal collection and supplied with a 20 year guarantee against corrosion. The Shannon collection boast simple classic lines and are corrosion proof and impact resistant. The bodies are manufactured from black polymer and shades are in polycarbonate, with IP44 rating and class II double insulated, they are ideal for tough coastal climatic conditions. The guarantee covers this fitting installed anywhere, including the toughest of conditions right by the coastline without exclusion. It covers the finish against corrosion or UV degradation. The finish can be protected by a regular wipe with an oily cloth from time-to-time. Exterior fittings must have an IP (Ingress Protection) rating which indicates the fittings ability to prevent solids and liquids penetrating the enclosure. The higher the number, the greater the protection. The minimum rating for an outside light exposed to the weather is IP23. This hanging outdoor porch lantern is rated IP44. This is a class II double insulated outside porch light that must not be earthed and suitable for older properties without an earth loop. Ideal for lighting a front or back porch to welcome visitors to your door. There are matching fittings available in the Shannon outdoor lighting collection that can be viewed by scrolling down this page. This exterior light is supplied by Elstead Lighting, a British company that specialise in the manufacture and distribution of quality decorative lighting such as the Shannon 1 light rust proof hanging outdoor porch lantern in black with polycarbonate shade and rated IP44 you see here.